Successfully Added Pocket Watch with 4GB Memory (Sherlock Holmes Edition) to your Shopping Cart. Made only for the coolest people who can seriously pull wearing something like this off. That is not to say you are not. This very cool and attractive pocket watch with 4 GB's of internal memory also comes with a stand alone feature. That way, you can just place it on your desk, in case you chicken out of wearing this awesome gadget. If looking cool is your game. Then you should definitely get this pocket watch. All your friends will become jealous and ask you, "hey, where can I get one of those". Well, when that happens, you can start buying the Sherlock Holmes Edition Pocket Watch in bulk, and sell them to friends, family, and work colleagues, turning yourself a nice profit at the same time. This pocket watch comes in an antique looking design to give it that additional look of authenticity, as well as the feel of authenticity with its chrome exterior and printed roman numeral numbers around the clock face. This surveillance gadget also comes with motion detection recording. This means you can set it and simply leave it to record whatever passes its way. This function is perfect for making sure no one snoops around your desk or home while your away. Further-more, provided with this surveillance pocket watch, is an elegant 2 feet long chain that gives you the versatility of wearing this pocket watch, by attaching the chain to your belt hook, vest or shirt. This gadget clock is suitable, for geeks, actors, costume designers, private investigators, the old and young, as well as pimps. 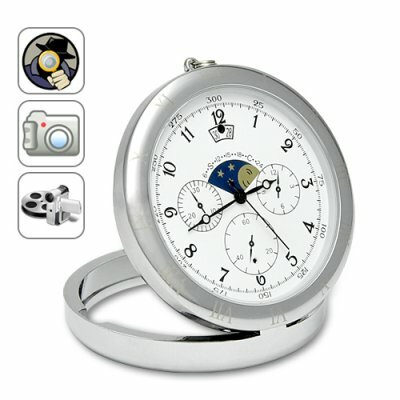 For a super cool gadget that records video in computer friendly AVI and takes images in JPEG formats, look no further than this pocket watch. This clock is brought to you by Chinavasion at a wholesale price. Click "Add to Cart" now, and Chinavasion will express ship you a sample straight away.